We talk with Stanisław Słowiński, jazz violinist and frontman of the Stanisław Słowiński Quintet a few days before the band's departure for their second tour of China. 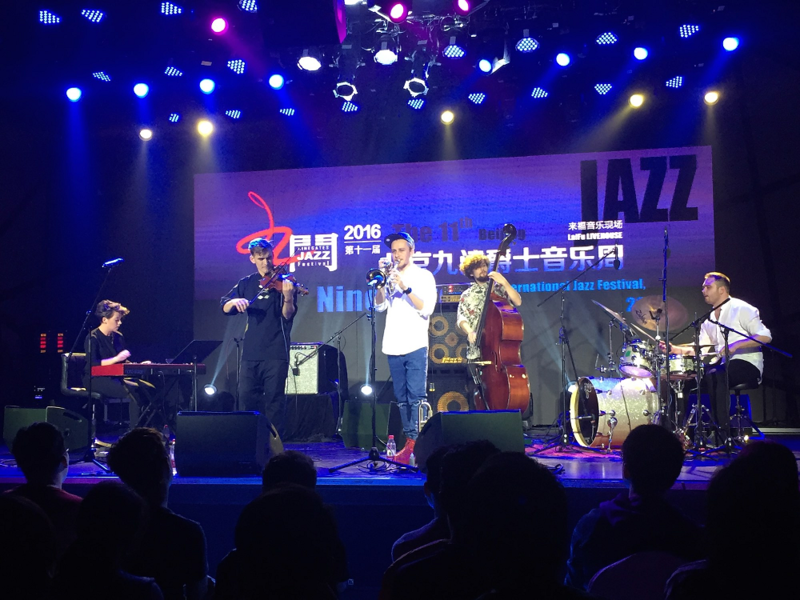 After last year's concerts at the Nine Gates International Jazz Festival in Beijing, the band returns to China at the invitation of the Chinese Ministry of Culture. The quintet will play four concerts as part of the Central and Eastern European Cultural Season in Lanzhou and then perform in Xi'an, Shanghai and Beijing. The tour, carried out as part of the Jazz Po Polsku project, is organised in collaboration with the Chinese Jazz Association, the Adam Mickiewicz Institute under the brand Culture.pl and the Polish Institute in Beijing. Zofia Gulczyńska: This is your quintet’s second tour of China. Could you tell us what was the most surprising thing for you during last year’s tour? Stanisław Słowiński: I was surprised to find out how open and sensitive was the local audience to our music. The reception was really fantastic; I felt that we made a really good contact with the audience. The workshop we conducted at the Beijing Midi School of Music was also a very nice surprise for me. I was a little tense before the workshop, because I do not speak a word of Chinese. That is why the whole lecture had to be translated, which can sometimes interrupt the communication process and slow down the narration of the whole situation. Another challenge was the fact that the vast majority of workshop participants were focused on heavier genres of music. The workshop was really great though, everyone got very involved in it. Once again it proves that the distinction between music genres and styles is not that important – the only thing that matters is the message that music brings. This year's China tour will be different from the previous one – the band’s line-up has changed, you will also perform in new venues. Can we say that the Chinese audience will see a brand-new SSQ? Will your band show a completely different face? It’s true, this time we are going to China with a slightly modified line-up. The band’s permanent members Zbyszek Szwajdych (trumpet) and Justyn Małodobry (double bass) will be joined by Joachim Mencel (piano) and Piotr Budniak (drums) for the first time. I am very happy to return to China with my quintet in such a short time, especially because it will be quite a big tour. This time we will visit very different cities, which will give us the opportunity to see different faces of China. I have to admit it is a very inspiring and interesting prospect. Answering the second part of your question, I wouldn’t say that we are coming back to China with a brand-new band. The music we are going to play on the tour is a continuation of the vision formed during the concerts promoting our first album Landscapes Too Easy To Explain. Although the compositions, my musical language have evolved since our previous visit to China, the core of our music, that is focusing on the emotions and the message the music brings, putting them in the very centre of attention, remains unchanged. During the tour you will be promoting your new album Visions | Beetween Love and Death. Please tell us something more about this album. Our concerts in China will launch the tour preceding the release of the album, which is expected early this autumn. It will be distributed worldwide by Hevhetia, one of the major European record labels. Great musicians such as Szymon Mika (guitar), Kuba Płużek (piano), Justyn Małodobry (double bass) and Dawid Fortuna (drums) accepted the invitation to participate in the recording. We are now arranging the final details of the entire promotional tour, I promise they will be announced soon. For now I can only say that we are bound for a real concert marathon. Are you preparing anything special for the Chinese audience, apart from the music from your new album? During our last year's tour I learned that the Chinese audience is very sensitive and gets very involved in the shows, so this time I would like to allow some more space for improvisation. This kind of playing may seem challenging for the listeners, but it allows for almost unrestricted communication with the audience, and I feel that the Chinese audience is absolutely ready for it. What are your hopes for this tour? What should we wish you? My hopes are the same as for any concert tour: to make good contact with the audience, to feel the flow of emotions and energy between us. Last year’s tour was a success. What will it be like this time? I believe even better!